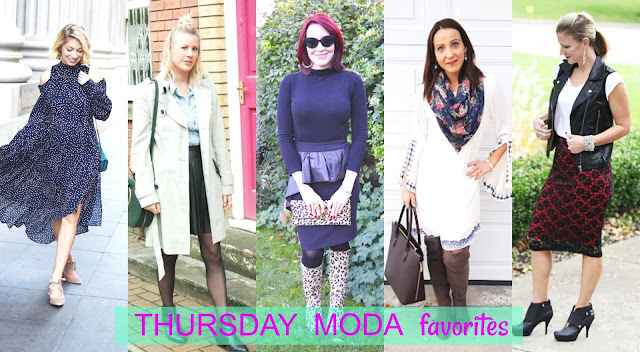 Today's Thursday Moda is all about Leggings and Tunics which are two Fall staples and my co-host MARY from The Mary Curator and myself will show you our take on these items. Tunics and leggings are not just trends anymore, they are must-have pieces for your Fall (and Winter) wardrobe. 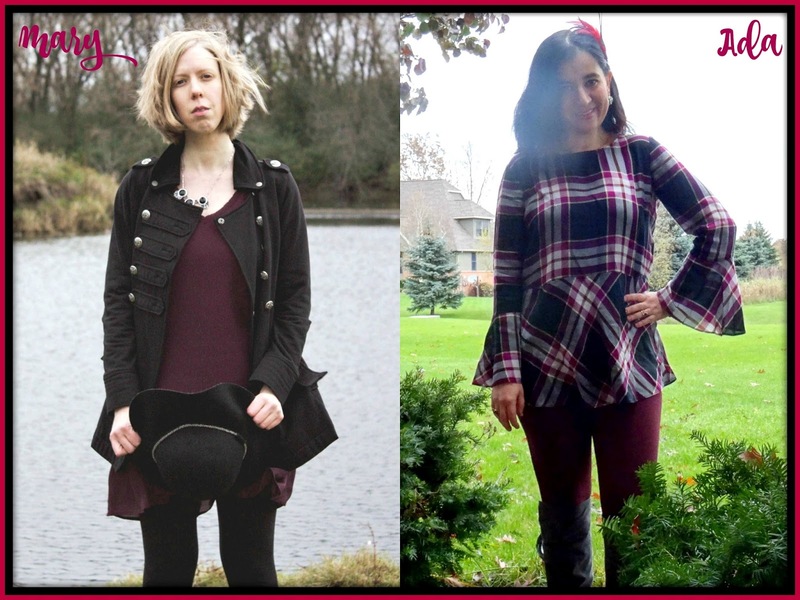 I love how Mary and I both chose Deep Burgundy and Black in our outfits which wasn't planned. Mary has co-hosted with me before as you may remember our End of Summer posts where we styled maxi dresses. Mary's style is a mixture of retro, classic, tailored and bohemian where neutral colors and monochromatic looks dominate. She recently chopped her very long hair into a bob which I did a year ago also - you know I love a cute bob. But if you follow Mary for one reason only - if not for her beautiful fashion - is the fact that each blog post has a story behind it. Mary's storytelling is as beautiful, delicate, artistic and unique as her gorgeous photography. Any shade of burgundy and anything that looks and feels like leather is perfect for Fall. My leggings combine the colors of burgundy and black, since they have black, faux leather palettes off each side (on the outside, you can't see because my tall boots cover them). These Burgundy/Bourdeaux Leggings have been in my closet for the past 3 years now. They have still kept well even after washing them. The fleece lining makes them cold weather-friendly too and trust me when I shot these photos yesterday on Halloween, it was so cold, almost freezing. I wanted to put my coat back on, right away. Isn't this Plaid Peplum Grey/Black/Burgundy Tunic so pretty. It is current (and on sale) at Loft. It also comes in a dress version. Both have the tie-back detail and the long bell sleeves - such cute and feminine trends. 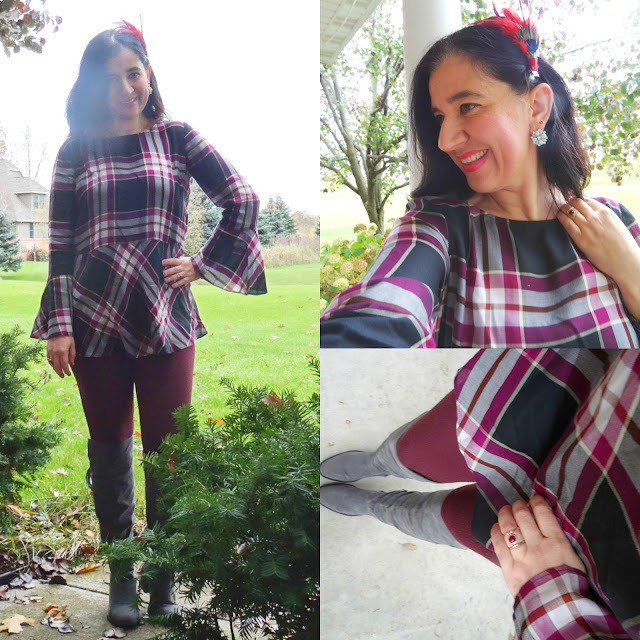 Also the pattern and colors of this make the plaid top or plaid dress for that matter perfect for Fall and all through the holidays. 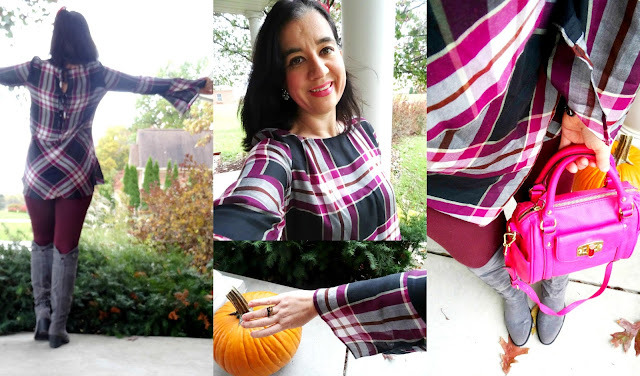 I cannot believe how perfectly well this tunic looked with my leggings. Plus the plaid peplum picks up every single individual color of this outfit. "I love a good shift dress and was eyeing one from a pricier brand all last year. I was very happy to find this similar tunic option available for a fraction of the price. I wear a lot of black during the winter (no shame here) so I topped off the feminine look with a military style coat and a floppy hat (which may or may not have blown off a million times when I was taking pictures). OTK boots are in, but I just love my ankle boots, and the ankle boots and tunic length help to make my short legs look a little longer. The playfulness of the outfit helped to inspire the story I’ve written for the blog today. 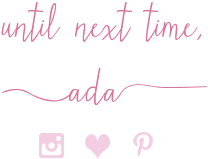 (Be sure to stop by!)" THE ACCESSORIES AND THE MAKEUP. I told you guys this is the outfit I wore for Halloween so I wanted a makeup look which was a little fancier, heavier and dressier than even my more dressed-up kind of makeup, on the daily. I went with a bold raspberry/fuchsia lip color (linked on the widget), a pink blush for my cheeks, I double-coated my eyelashes with a super black mascara and I even added a brown eyeliner. Also, I put on a peacock-style red bow barrette in my hair (brushed sideways). I love that it is red and it pops - perfect for all the burgundy coloring of my outfit. Another thing that pops is my beautiful Hot Pink Satchel Crossbody Bag. This bag is pretty small but yet big enough to carry the necessities. It is from Target, give or take 1.5 years ago but they come out with similar satchel bags like this in different colors, each year. I also have a larger, roomy purple version of this bag. It feels like leather though it is not. It is very well made and I love the fun clasp on that front pocket. I love the bright pink with the burgundy and red, too. Between all the different shades of red and pink, I told you this outfit is perfect for the holiday season, too. I think between the tunic and the leggings I paired it with, this outfit gives me Christmas vibes so consider it my first holiday outfit. I would wear this to a Christmas exchange dinner with friends, Thanksgiving dinner and/or even holiday shopping since this outfit is chic, put-together and very comfy. The name of her blog couldn't suit Mary more perfectly, because not only she curates lovely outfits like the ones below (a few of my Fall favorites from her), but her pictures are 1000% curated for every post and so is every story she writes behind each post. I know Mary loves dark colors and her many neutrals but looking at these, I must say she looks great in pinks, fuchsia and berry shades. 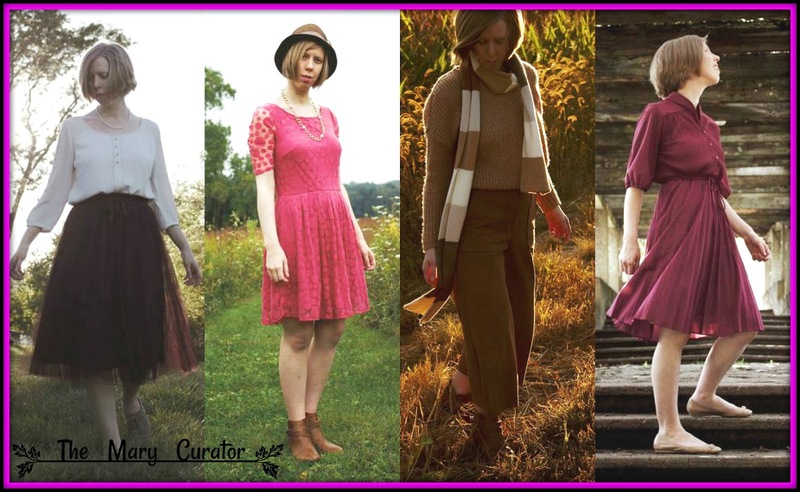 "The Mary Curator is a personal style blog exploring fashion through fantastical fictional lookbooks. It is my exploration into the aesthetics of style and how it communicates. I find that the real world is best understood through the practice of imagination, so I explore style in the same fashion." We had such a successful linkup last week with close to 130 outfits linked. I had such a hard time choosing favorites, but finally I narrowed it down to 5 favorite outfits with a couple of new faces in the mix - since some of the ladies joined Thursday Moda for the first time. So much great Fall layering and rich knits! Stefanie sees 'Beauty from a Tragedy' dressing sharp and girly for a wedding in San Francisco. She is playful, regal and as always very stylish, in a midi dress. Kelsey proves that 'Trench Coats' are classic and fabulous from work to play. Her office-ready outfit is elegant and comfortable. 'Leopard Print Boots' and a matching clutch look so great with all the royal purple that Emma wore. Her mixed media peplum pencil skirt is stunning. Bojana showed us 'How to Style a White Dress for Fall' - a type of outfit I love since I wear my little white dresses all year long. Hers is boho-pretty with bell sleeves and an embroidered motif. Carolyn in 'Moto Vest and Lace' can go to a wedding, church, the office or a date night in her outfit. I love when outfits have multi purposes.